Thames Water has launched a three-pronged aerial attack in its hunt to find and fix leaky pipes. The company is using a fleet of drones, an aeroplane and a satellite to support its mission to get back on track with its leakage targets by 2020. The “eyes in the sky” have spotted dozens of possible leaks using thermal imaging and infrared cameras and the technology is “providing an invaluable tool in the fight against leakage,” Thames said. Teams fix more than 1,000 leaks a week across the company’s 20,000 mile underground pipe network and the aerial approach will give them “another helping help”. Technicians currently use acoustic loggers on pipes to listen for water escaping, and also use data to track how much water is going through pipes compared to how much was produced at the treatment works. Visible leaks are also reported by both staff and members of the public. Thames Water said it is “determined to use every tool possible” to get leakage down further. The company has restructured its teams to tackle leakage and is investing in people and resources. Its fleet of five drones, all manned by fully-qualified pilots, can fly more than 100 metres high and a distance of 500 metres to survey huge landscapes. In July, they flew 28 times with on-board thermal imaging cameras beaming live footage back to screens where experts look for leaks. In three flights, they found leaks within 60 seconds of launching, which are now in the process of getting fixed, Thames said. Thames Water has teamed up with company Earth-i for the trial project, which has proved “particularly useful” during the prolonged dry and hot spell, the company said. 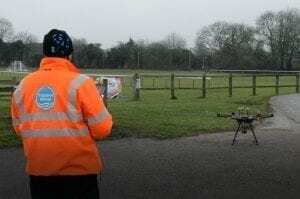 Thames is also using an aeroplane with an infrared camera, which has predominantly been flying over the rural areas of the Thames Valley and south London. As part of a joint project alongside the Water Research Centre the camera on board the Vulcanair aircraft takes hundreds of pictures, which are then analysed by special software which can pinpoint areas where leaks can be found.